What's in stores this Wednesday? New adventures for Rick Grimes, the baddest bastich from Czarnia, and Ultimate Captain America. It may be a new year, but the world of comicdom is just as deadly in 2011. First things first, Terry McGinnis gets further adventures in the new Batman Beyond (DC) ongoing series, and the Weird Worlds (DC) miniseries covers some of the stranger, intergalactic, and fantastical characters of the DCU such as Lobo and Garbageman. Lobo fans will also be happy to read DC Comics Presents: Lobo, an oversized book that reprints the last Czarnian's early adventures with Superman and Etrigan. 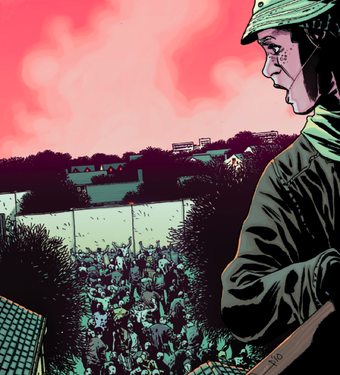 For more gory thrills, there's also the newest Walking Dead (Image) — this issue delves into the dangers of being trapped in a compound with a thousand ravenous zombies outside. For those readers who need a refresher, The Walking Dead Weekly reprints undead tales from the comic's very beginning. Jason Aaron takes Ultimate Comics: Captain America (Marvel) to Vietnam in a new miniseries, which should be interesting given his work on the graphic novel The Other Side. And in a new issue of Torchwood (Titan), Jack, Gwen, and Ianto investigate a haunted manor. As far as graphic novels go, David Tischman's Fraction (DC) — which is about four Philadelphia toughs who stumble upon a battle suit — is back in print. The second omnibus of Garth Ennis and Darick Robertson's The Boys (Dynamite) is out, and the new Avengers Assemble trade paperback collects the beginning of Kurt Busiek and George Pérez's run. As usual, here's the list of everything being released to comic stores tomorrow, and you can find your nearest comic retailer here. Happy reading, gang!